Ida Minerva Tarbell (November 5, 1857 – January 6, 1944) was an American writer, investigative journalist, biographer and lecturer. She was one of the leading muckrakers of the progressive era of the late 19th and early 20th centuries and pioneered investigative journalism. Born in Pennsylvania at the onset of the oil boom, Tarbell is best known for her 1904 book, The History of the Standard Oil Company. The book was published as a series of articles in McClure's Magazine from 1902 to 1904. This one masterpiece of investigative journalism would bring about the dissolution of Standard Oil as a monopoly and lead to the Clayton Antitrust Act. Her book would also lead to the Hepburn Act in 1906 to oversee the railroads, the 1910 Mann-Elkins Act which gave the Interstate Commerce Commission power over oil rates, and the creation of the Federal Trade Commission (FTC) in 1914. Tarbell also wrote several biographies over the course of her career which spanned 64 years. She wrote biographies on Madame Roland and Napoleon Bonaparte. Tarbell believed that "the Truth and motivations of powerful human beings could be discovered. That Truth, she became convinced, could be conveyed in such a way as to precipitate meaningful social change." She wrote numerous books and works on Abraham Lincoln including ones that focused on his early life and career. After her expose on Standard Oil she wrote biographies on businessmen Elbert H. Gary, chairman of U. S. Steel as well as Owen D. Young, president of General Electric. A prolific writer and lecturer, Tarbell was known for taking complex subjects—the oil industry, tariffs, labor practices—and breaking them down into informative and easy to understand articles. Her articles drove circulation at McClure’s Magazine and the American Magazine and many of her books were popular with the general American public. After a successful career as both writer and editor for McClure’s Magazine, Tarbell left with several other editors to buy and publish the American Magazine.Tarbell also traveled to all then 48 states on the lecture circuit and spoke on subjects including the evils of war, world peace, American politics, trusts, tariffs, labor practices, and women’s issues. Tarbell took part in professional organizations and served on two Presidential committees. Tarbell helped form the Authors’ League (now the Author’s Guild) and was President of the Pen and Brush Club for 30 years. During World War I, she served on the President Woodrow Wilson’s Women’s Committee on the Council of National Defense. After the war, she served on President Warren G. Harding’s 1921 Unemployment Conference. Tarbell, who never married, is often considered a feminist by her actions but maintained views on women’s suffrage which were controversial and may have tarnished her overall legacy. Tarbell completed her autobiography, All in a Day's Work, in 1939 when she was 82. Reviews were mixed for the book. She was working on another book, Life After Eighty, when she died of pneumonia at Bridgeport Hospital in Bridgeport, Connecticut on January 6, 1944. She had been in the hospital since December 1943. She was 86. In 1993, half a century later, the Ida Tarbell House in Easton, Connecticut was declared a National Historic Landmark. 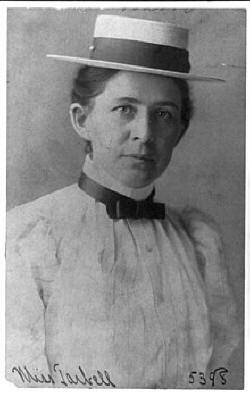 In 2000, Tarbell was inducted posthumously into the National Women's Hall of Fame in Seneca Falls, New York. On September 14, 2002, the United States Postal Service issued a commemorative stamp honoring Tarbell as part of a series of four stamps honoring women journalists. The History of the Standard Oil Company was listed as No. 5 in a 1999 list by New York University of the top 100 works of 20th-century American journalism. After Tarbell bought her farm in 1906, her household expanded to include a number of family members. Tarbell resided with her sister Sarah in Easton, Connecticut at Rock House and Valley Roads. Over the years, several other family members also lived on the property, including her niece and nephew, Clara and Tristram Tripper, who lived in a cottage. Tarbell's brother Walter and his wife also came to live there after Walter suffered an emotional breakdown. The farm in Connecticut is a national historic landmark.